Officer Keith Nickrand. Photo courtesy of the Huron Township Police Department. 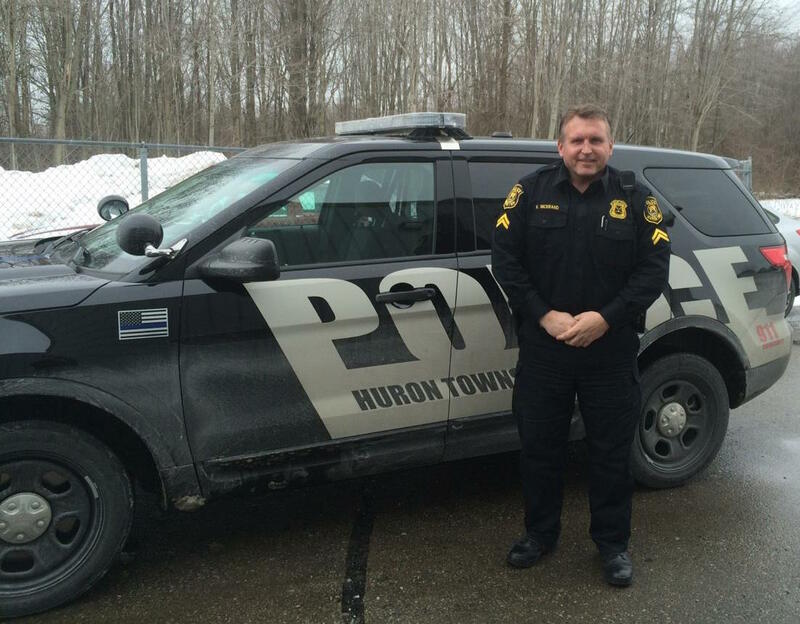 Huron Township Police Officer Keith Nickrand was commended in a letter from Police Chief Everette Robbins for his actions during an emergency call on Sunday, Feb. 8, 2015. In the letter, Robbins stated that he received an email from Huron Township Fire Department Sergeant Tommy Widmer, who explained to Robbins that he felt compelled to contact the chief of police to inform him how Nickrand responded to an emergency situation over the weekend. According to the letter, Widmer advised Robbins that an incident occurred on Sunday at the Chapp’s Landing gas station, 35777 South Huron Road, New Boston, MI, involving a 3-year-old boy who had gasoline in his eyes. Upon his arrival, Widmer observed Nickrand in the bathroom with the family. After advising the responding fire personnel of the current situation and after the patient had been cared for, Nickrand was seen talking to the patient’s young sister, who according to Wider looked scared and frightened. Widmer could hear Nickrand telling the little girl that everything would be ok and that she was being brave. Nickrand then asked Widmer if they had a teddy bear they could give to the little girl, similar to the one that responding fire personnel had already given to her brother. Unfortunately the fire department didn’t have any extra teddy bears on hand, so instead, Nickrand came back with a Burger King bag of french fries for both her and the injured 3-year-old brother. Nickrand apologized for not having a teddy bear, but did make note that there were extra ketchup packets and napkins in the bag. Robbins said that in the letter, Widmer noted that the incident touched his heart that it made him proud to be in the public safety profession. “This simple, unselfish, good deed can’t go without notice,” said Widmer in his email to Robbins. “The fact that he would spend his own money, have the thought and care to go that extra mile is amazing to me. The smile on her face is still in my mind as I type this email. Its officers like Officer Nickrand, which give Police and Fire the upmost respect from citizens we deserve. Job well done!” said Widmer. Robbins noted in his letter that this incident highlights the outstanding working relationship that the Huron Township Police and Fire Departments have with each other. “We often hear the negative comments about law enforcement personnel,” he said. Robbins noted that in this case, Nickrand went above and beyond to make sure that two young children had a positive experience out of an incident that could have been traumatic for them. “I am proud of your teamwork and your compassion for this family,” Robbins said. This entry was posted in Community, Front Page News, Police & Fire on February 9, 2015 by Scott Bolthouse. Congratulations Officer Nickrand! That little girl will remember you forever……..believe me………I was that little girl once. Nickrand is always like this if he sees someone is in need he is there I have seen this man in action on a number of occasions. Im glad he got the letter thatis aawesome. Thank you sir for your service. Yup, still ‘My American Hero,’ 15+ years later! Officer Keith Nickrand has been going above and beyond for our community since before I was in Junior high (I’m almost 30 now), and it warms my heart to see him get a bit of well-deserved recognition for his admirable works. KUDOS to all involved!